In the age before accurate charts marking depths and hazards to navigation, sailing a ship along an unfamiliar coast could be a dangerous business. Imprecise methods used to determine a ship’s location compounded the problem. Even the best navigators sometimes found themselves in uncomfortable situations. Groundings and strandings remained inescapable, and often fatal, part of a seafaring life. Captain William Bainbridge discovered this the hard way when he ran USS Philadelphia onto an uncharted reef off Tripoli during the Barbary Wars. Oliver Hazard Perry wrecked the schooner Revenge on a reef off Watch Hill, Rhode Island in 1811. USS President, under the command of Stephen Decatur, struck a sand bar at the mouth of New York Harbor while trying to run through the British blockade in January 1815. The ship was damaged enough to impeded her sailing qualities, leading to her capture a day later. Constitution suffered her own share of mishaps during her long career. The first recorded grounding occurred off Cape Francois, Santo Domingo in July 1800. As Constitution sailed from the harbor, the wind shifted, taking the sails aback and forcing the ship stern first onto a reef. “The Shock was sensibly felt and Violently repeated,” reported the log. After forty-seven minutes of shifting stores and heaving up anchors, the ship floated free without too much damage. Nevertheless, Sailing Master Nathaniel Haraden reported several years later that the ship, now “in ordinary,” seemed to make a considerable amount of water, probably because of the grounding off Cape Francois. On the night of May 16, 1835, Constitution very nearly came to grief on the Scilly Isles at the western end of the English Channel. Returning from France with Minister Edward Livingston on board, the ship struggled against strong winds as she beat down the channel. That night, the officer of the watch reduced sail, but the winds blew the ship farther to leeward than expected. When the lookouts discovered breakers ahead, Captain Jesse Duncan Elliot boldly ordered more sail set to claw off the lee shore. The ship barely squeaked by, running at nine knots through the foaming sea, but at last left the dangers of the shore behind. 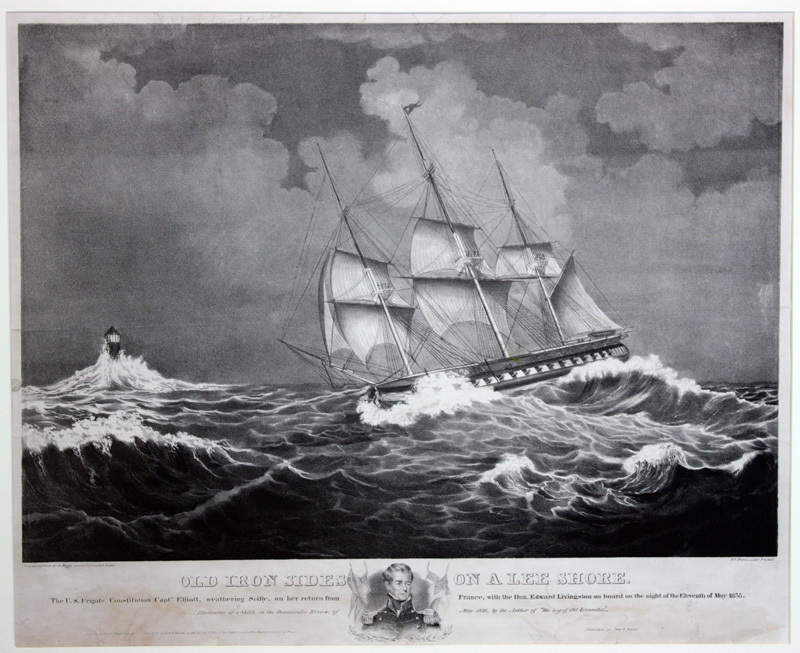 In this 1839 lithograph published by Duval and Dow, Constitution sails close hauled through pounding seas to weather the Scilly Isles. USS Constitution Museum collection. The English Channel seems to have had it out for Constitution. Forty-four years later the ship had another run in with the English coast. This time the aging frigate carried home American exhibits from the Paris Exposition. On the night of January 16, 1879, the ship out sailed her navigator’s expectations and ran gently aground beneath the white chalk cliffs at Bollard Head. By morning, tugboats arrived on the scene. After much straining and a few parted hawsers, they finally towed Constitution into Portsmouth. Three days later, an inspection in a Royal Navy drydock confirmed that little more than superficial damage had been done. Artist-in-residence Chet D’Andrea recreated Constitution‘s 1879 grounding in this 1993 acrylic on canvas painting. USS Constitution Museum collection.